There are two things that I use Google Assistant for very frequently. They are reminders and timers. It is so easy to start a timer using the Assistant. On my phone, Assistant starts the timer using the default Clock app. This gives me a visual timer and it is easy to handle it, see the remaining time etc. Things aren’t that great on Chrome OS. On my Pixelbook if I start a timer, I don’t get any visual cue that the timer started. There is no way to see the remaining time as well. When the timer is up, a notification will show up along with the notification sound. If I click “Stop” on that, it sends a “Stop timer” command to the Assistant. 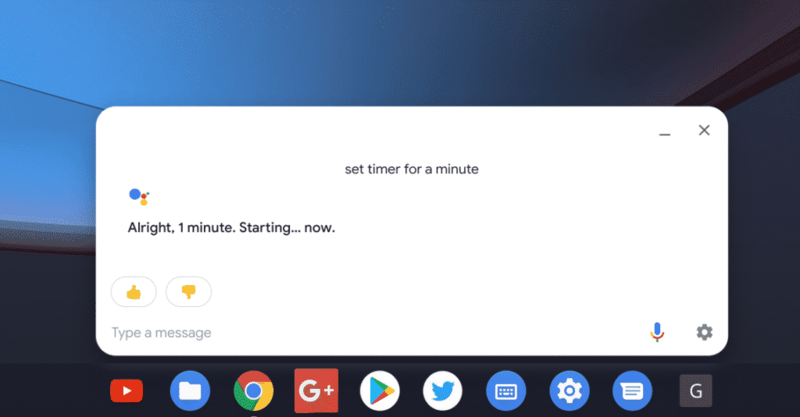 Yes, you can see Assistant launching and respond to this command. Looks like this is going to change. A recent code commit talks about adding a tick behavior to Assistant timer. Add tick behavior to Assistant timer notifications. From the way it looks, we will have a timer running on the notification tray, along with the remaining minutes and seconds. I don’t see any mention of the Android Clock app in the code committed today. So, it is most likely to be a Chrome OS-specific notification. I’ll share an update when this feature is available for us to test!